The traditional lecture system is used to introduce a subject and discuss the broad concepts in that specific field of study. Interactive lectures to smaller groups remain an effective and essential way of teaching. More recent methods of learning and teaching, such as case-based learning and small group-based problem-solving sessions are also employed. 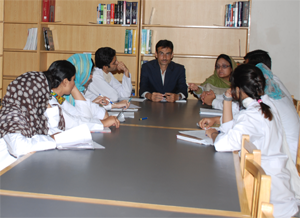 Small group and tutorial sessions are regularly held every week to enable students to discuss the details of a lecture topic. Students are expected to prepare presentations on applied topics and discuss their implications with their fellow students. The lecturer acts as a facilitator. By participating in these group discussions, students have the opportunity to interact and learn from one another. Practical sessions are conducted to reinforce concepts developed during theoretical sessions. Laboratory work is a vital part of Physiology, Biochemistry, Histology, Microbiology and Pathology courses, and provides an opportunity for students to make their own personal observations in relation to their theoretical knowledge they gain. Gross Anatomy is mostly learnt during the practical session in the dissection hall. Lectures and tutorials are held for providing clinical orientation on the subjects. Clinically-oriented topics are identified within the framework of anatomical information, which are structured, and case-based learning. Theoretical and practical knowledge is supplemented by filed visits and clinical case presentation to provide students with essential hands-on experience and a sciences and clinical practice. The university regularly organizes seminars where groups of students are encouraged to independently present topics of general interest before a larger audience. This encourages students to read beyond their textbooks and learn how to support their knowledge with research. The university offers remedial program for students who face difficulties in learning or show deficiencies in their academic performance. These programs consist on topics already covered or currently being taught. Upon evaluation, any particular area is reinforced in the remedial program. BUM&DC is committed to provide the kind of environment and training that would enable professionals to successfully contribute to the improvement of the health sector, particularly in low income communities under the Community – Oriented Medical Education Program. The university involves its students in research –developing work in these designated communities. Students are encouraged to participate in the preventive and curative care and management of patients and their families in Primary Health Care field settings.